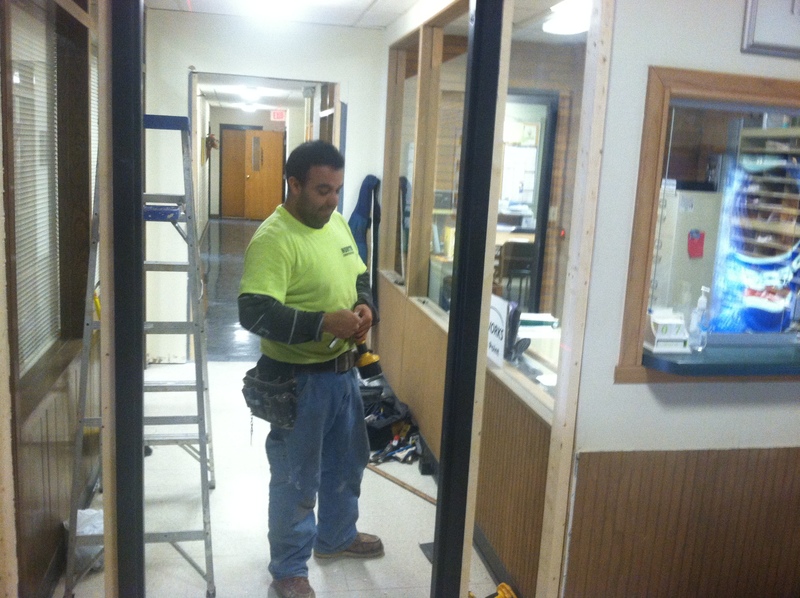 Olmes Medrano, an employee for North Construction, works to install a security door in the hallway that leads to staff offices at Muscatine Center for Social Action. Let’s put today at MCSA in the file labeled busy. Trane Heating and Air Conditioning Services & Systems, who fixed a furnace problem in the Family Shelter. Lucas Communicatons, who will be installing a new telephone system. North Construction, who are finishing a renovation of the bathroom in the Emergency Shelter and have begun installing a new security door at the front desk in the lobby. Nelson Electric, which sent Beau Nelson, one of my buddies at the Muscatine Community Y, to do electrical work for the new security door. 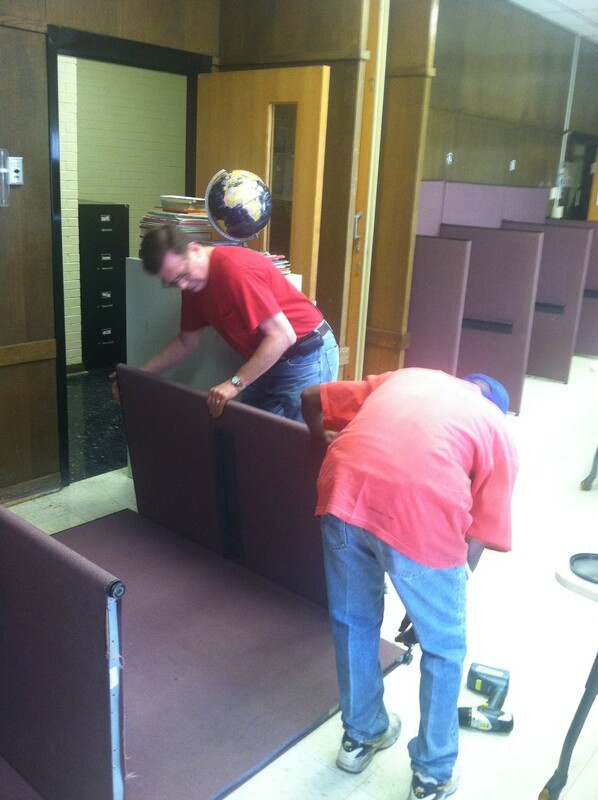 Tom Curry, left, MCSA building manager, works with resident Michael Vivians to empty out the Learning Center at MCSA. Divide the Learning Center in half while managing to keep all 10 of its computers in use for MCSA residents and the public. Move three employees into a new office in the other half of the former Learning Center. Move me into the office that adjoins the office of MCSA Executive Director Maggie Curry. Move Teresa Cardoza, an MCSA caseworker, into my old office. Open up Cardoza’s old office, which will become shelter space for families. And in addition to everything else, I met with the MCSA Marketing Committee, a new resident moved into one of the rooms in the Men’s Dorms and a mom and her daughter moved into the Family Shelter. Oh, and my friend, Danelle Much, the Family Nutrition Program Assistant for Iowa State University Extension in Muscatine and Louisa counties, met with some residents of the Family Shelter for a new program on healthy lifestyle choices. All in all, just another day at the office. Can’t wait to see what tomorrow brings.